How Writers Write Poetry posted the video for lesson 10 – Sonic Association. The assignment was to write a poem off a word list. Larissa Szporluk gives her undergraduate class the word ventriloquist to work from. She read a few of the poems her students turn in. They all had their own unique flavor. We could generate a word list from the same word or use rhyming word pairs Carol Light discussed at the start of the video. Since it was a lesson on sound and I love onomatopoeia, I decided to generate my word list from it. Onomatopoeia to write sound poetry what a great idea. Oh wow! There’s a rhyming pair already. As I’m still trying to find my footing after my vacation, I decided to make an acrostic poem – Sound. Yesterday I had to deal with a plumber to change the cartridge in my shower. When I got home Thursday I noticed the constant drip. Don’t know how my hubby didn’t hear it. But that sound annoyed me till Sunday when my hubby took off the shower handle to change the cartridge only to find our hard water foiled the cheap fix and we had to call a plumber. Needless to say I got a couple good tweetkus out of it for the haiku challenge words on twitter. How Writers Write Poetry lesson for today is Constraint Based Poetry. This morning I already wrote a tyburn poem. The form has a lot of constraints. In fact I had to edit it, because pile is one syllable. I did not mind though. I originally had piled high, but thought piled was two syllables. I was able to go back to the version I preferred. At the end of the lesson, Christopher Merrill talked about writing a poem that had one word per line and added one letter to each line. So I built a poem with this constraint. For those interested here is an explanation to writing tyburns. Actually I haven’t been neglecting chores. I’ve gotten quite a bit done the past two days, including laundry. Tweetspeak poetry shared 10 laundry poems which was part of the inspiration for this tyburn. The other part was how trashed my house can become when one man is left alone for two weeks. I’ve been visiting family back in Buffalo, NY the past two weeks. It was just me and the girls. My husband stayed home alone for two whole weeks. I knew I would have catch up chores to do, but I thought he would do some cleaning. His excuse, I made sure the animals didn’t die. We got in at 9am yesterday and the first thing I decided to do was tackle the vacuuming. 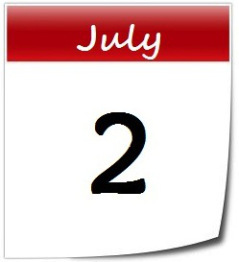 While I was doing this, the little one came up to me and asked what the date was – July 24th why? I knew it; the milk says July 21. She drank most of a glass until she noticed chunks in the bottom. Ewww… After I vacuumed, I cleaned the cat litter and noticed the toilet was not cleaned in two weeks either. We have hard water build up. I scrubbed but it was not completely coming off. I usually clean my toilet twice a week to help keep the hard water stain in check. I put some white vinegar in the bowl to sit over night. It looks better, but it’s still going to need more scrubbing. I was worn out from travel and cleaning so we only did soup for dinner. Then I went to watch the 6pm news. By 6:30 I was snoring and didn’t wake up until 7 this morning. Today I’m working on more cleaning and catching up with the lessons at How Writers Write Poetry. Yesterday Rachael brought her suitcase into my room. I thanked her for bringing my suitcase over before I noticed it was the wrong one. Then I noticed she was unpacked already! She brought it to me to put away. This morning I unpacked my suitcase and Dad was able to put two of them away before heading to work. Then I worked on bills. I paid everything that came in before we left and told hubby he shouldn’t have to pay anything unless something comes in I’m not aware of. Well doctor bills came in and were due July 22. Hubby said, I told you they came in. I said, And you didn’t notice the due date? Oh well if he was on vacation with us, the bills would be late anyhow. A few days won’t hurt anyone. I actually did this poem before leaving on vacation, but did not have an opportunity to post it. I’ve watched the video lessons for Meter and Containing Multitudes this morning. I enjoy working with meter. I write a tweetku for the #haikuchallenge on twitter as often as I can. Because I’ve been out of the writing swing for a couple weeks. I went over to see what the haiku challenge word was today, left. I wrote a senryu but so far that is the extent of my poetry writing today. And my dryer just called me so I’m off to switch the laundry over. On vacation in Buffalo, NY right now. Thanks to Silver Birch Press for featuring my poem among all the other great half year poems. The third video presentation in How Writers Write Poetry – Building a Poem. Daniel Khalastchi talked about image, metaphor, rhyme and lines to build your poem. He also, briefly, mentioned form. I began with a rondelet so my structure was pretty set. Though Khalastchi did talk about breaking form as Srikanth Reddy did in “Sonnet”. And I may do this in another workshop depending on the feedback I get from this assignment. 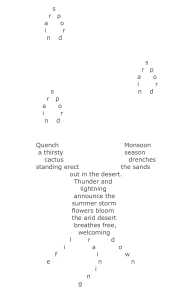 Thanks to Silver Birch Press for including “Monsoon Season” in their half year poetry series. IMAGE: “The Beauty of the Desert” by Saija Lehtonen. Prints available at fineartamerica.com. NOTE FROM THE AUTHOR: I chose to write about monsoon season for my half year poem, because the rains come in July and bring life to the desert plants. I also enjoy writing concrete poems. 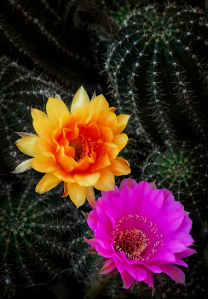 This poem can be read two ways depending on whether you start from the left cactus branch or the right one. Yesterday the second video for How Writers Write Poetry was posted. Kate Greenstreet talked about collecting lines. She called it her epic as she writes down interesting lines/tidbits from her day in one doc file. Then she culls from it individual ones to create poems. 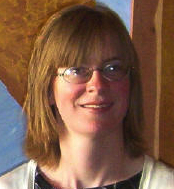 Lucy Ives talked about letting poems sit for one, two, ten years or even a lifetime. This gave me the idea to look at an old poem and try to rewrite it. I chose my first attempt at rondelet. I chose this one because I did not get the rhyme scheme correct. It should be A,B,A,A,B,B,A. What do you think? I know it is still a work in progress. It certainly is now repurposed since the first version and rewrite were created from a picture of my girls at Woodlawn Beach July 2012. The third version reflects how my world changed two years later.